Most of the time, chicken is present in every cuisine and recipe. It is a versatile meat which you can’t afford to miss in the culinary world. Though there are various ways to cook it, trying out new recipes could outstandingly bring out the real flavor and taste of the chicken. Now, have you heard of the words “spatchcock chicken”? That’s just one thing I’m referring to. You have probably heard or read this term before but most of you may not have encountered these words. Some of you might have prepared the chicken this way without knowing that it has an accurate term called for it. Spatchcock is a cooking term for the chicken recipe which is also called “spattlecock”. This is a process where the chicken is prepared for either grilling or roasting. The backbone of the chicken will be removed while the sternum is sometimes flattened out before the cooking process. This preparation process is often dubbed as “butterfl﻿ying the bird”. 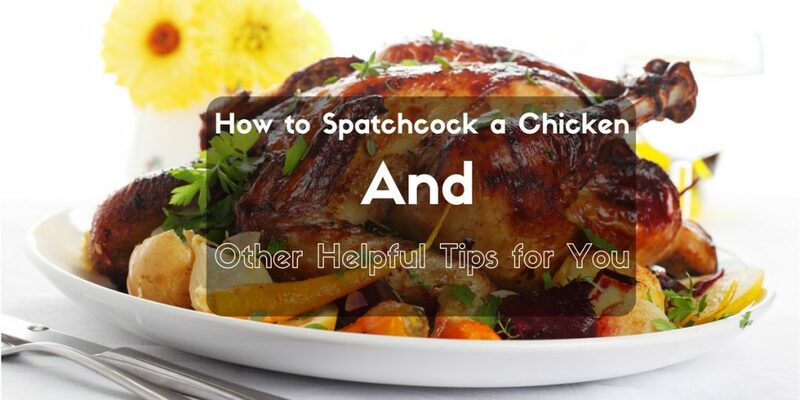 Furthermore, the word “spatchcock” refers to the chicken with the backbone removed even if the sternum is still present. Removing the sternum is optional if you want the chicken to lie more fully flatten. Are you tired of cooking the same chicken recipes? Well, you can try spatchcocking a chicken for a new diversity. But first, you have to know how to spatchcock a chicken. When doing this technique, it is important to remove the backbone of the chicken. It’s up to you if you want the breastbone removed too. This is the first thing that you have to do. Removing the backbone will allow you to completely open the chicken out and flatten it on the baking sheet. It will also lessen the cooking time, allowing the whole chicken to differently, quickly, and evenly be cooked. It’s either you grill, roast, or pan fry it. Even if the bone is removed, the juiciness of the meat is retained, along with its palatable flavor. 1. Lay the chicken with the breast side down and the legs facing you. 2. Remove the backbone by cutting along each side of the pygostyle (parson’s nose) and ribs with the use of poultry shears or strong scissors. 3. Open out the bird and flip it over. Using the heel of your hand, crack the breastbone to flatten it. This will reduce the thickness of the meat. 4. In order to keep the chicken flat, you can secure the legs using two skewers. You just have to run it through the thigh and breast meat diagonally . 5. Barbecue or griddle the spatchcock chicken for about 20 minutes on each side or you can roast it for about 40 minutes. This depends on the size of the chicken. You can also use a knife when removing the chicken spines. But if you are uncomfortable using it, use large kitchen scissors instead. Grilling brings out the juiciness and real flavor of the chicken. If you are going to butterfly a whole chicken, you can ask the butchers to remove the backbone or even the breastbone of the chicken. This will save you time when you have finally decided to prepare the bird. 1. Place the chicken in a pan and squeeze a lemon juice all over the bird. 2. In a small bowl, mix a small amount of olive oil, fresh chopped rosemary and thyme, salt and pepper to taste, and 2 cloves of minced garlic. This is for the herb paste. 3. 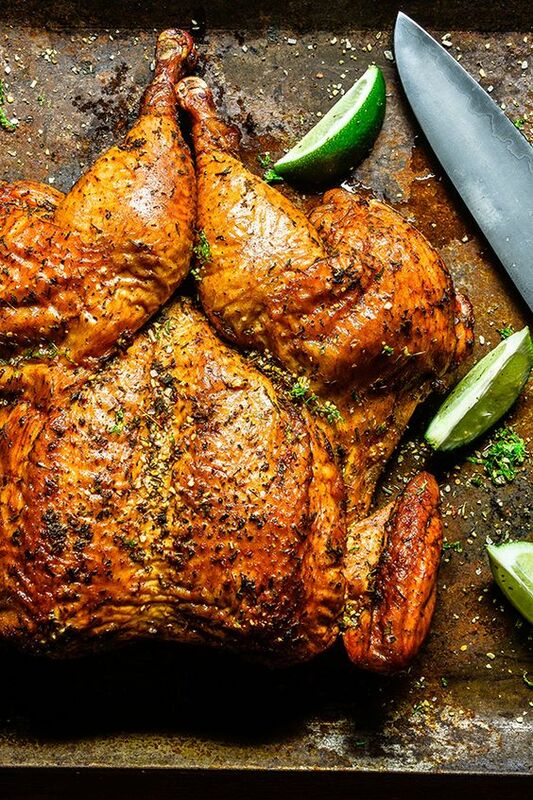 Rub the herb paste all over the chicken and underneath its skin using your fingers. Once the chicken is fully coated, you can dredge salt over it. 4. Cover the pan with a lid or a foil and let it sit in the fridge for 3 hours. While waiting, you can preheat the grill at low heat to avoid burning the chicken. Rub the grill with oil to prevent sticking. 5. Put the spatchcock chicken on the grill with the skin side up. Let it grill for about 15 minutes with the lid closed. When 15 minutes is over, turn the breast side down and allow it to cook for about 25 minutes. Constantly check it to avoid burning the chicken. 6. Once the thermometer measured 160°, this means the chicken is already cooked. You can also notice the juices emanating from it. Let it cool for about 5 minutes before chopping and serving. For the marinade, you can also use Italian salad dressing mixed with a half teaspoon of cumin and garlic powder. 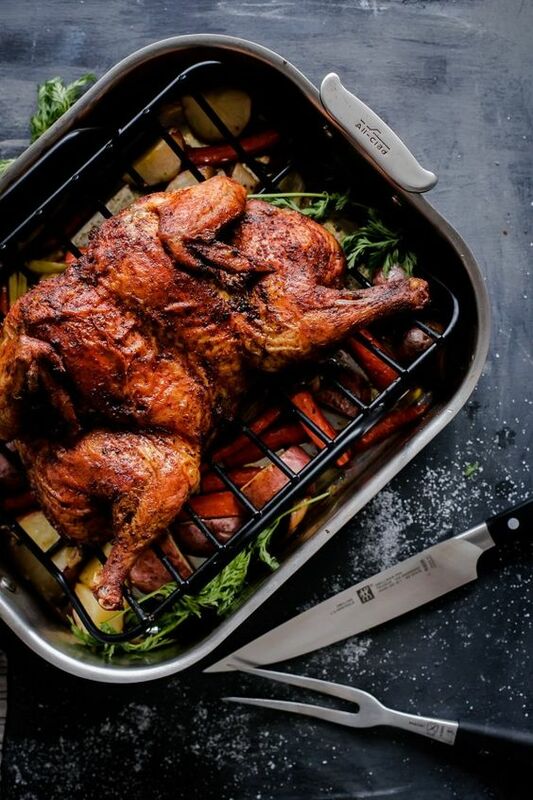 You can also put nonstick foil below the chicken to protect it from burning while grilling. Roasting the chicken will make it super-duper crispy and juicy. 1. Heat the oven to 230°C. Get a large baking sheet and line it with foil. 2. Put the chicken on a flat working surface with the breast side up and gently push it down until it cracks. Transfer the chicken and lay it flat on the sheet. Repeat the process with the other chicken. 3. Mix paprika, tarragon, salt, and pepper in a small mixing bowl. Add the oil and stir. With your fingers, rub the paste underneath the chicken skin until fully coated. Place the thinly sliced lemons under the skin in one layer. 4. Put in the oven and roast until the skin achieves crispness for about 35 minutes. If the thermometer reaches 165°F, it means the chicken is done. Let it sit for another 5 minutes before slicing and serving. The next time you cook a chicken recipe, you can try this technique for a more different taste. You can try making your own paste or marinades. 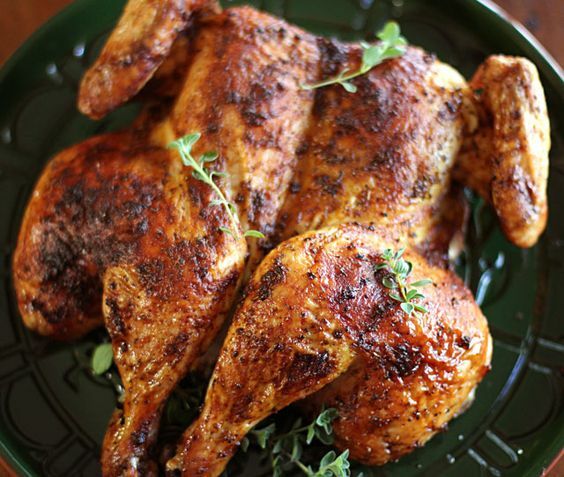 Spatchcock chicken is perfect for summer barbecue parties or outdoor picnics. 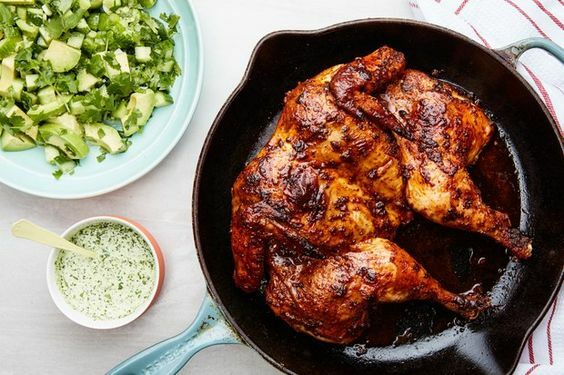 So, get your things ready and try making your own spatchcock chicken following these recipes.